The green roof is in! Here are a few pics of the final installation. As you can see, we will need a couple of growing seasons before the roof gets filled in. The sedum plugs will mostly grow outward and fill in the spaces in between. If certain areas don't fill in adequately, the homeowner can always add more plugs later (although JIG does provide a maintenance warranty and will fill in rough spots in addition to weeding for 2 years after installation) . To most, this might not be what was expected when imagining the green roof...but as with many landscape features, it will take time to mature and will get better with age. 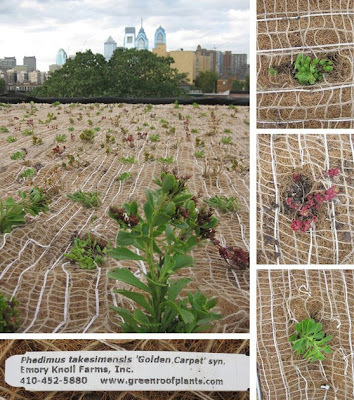 You can order trays of mature plants (which we are interested in trying sometime) for the "instant" green roof (check out "Live Roof") but they tend to be more expensive and hey...you miss all the fun of growing your own roof from scratch! A close up view of one of the larger plants and some of the other varieties. You gotta love the Philly skyline off in the distance. You can also see the tag of one of the main plant species and the contact info showing where it came from. Our sedums came from: Emory Knoll Farms. The wind protection (brown matting made from coconut husks) that is covering the dirt should only take about 1-2 years to completely biodegrade. An overall shot of the roof area looking north. The piece of plywood in the middle is sitting on top of the deck area (which doesn't have the boards laid yet). You can also see the roof hatch opening near the middle and the A/C pad at the left. A view looking south. You can see the location of the black scupper box in the corner of the roof. The roof hatch (a double glazed, low profile dome) is being ordered and should arrive soon. We still need to trim up the felt around the edges and install the Zalmag metal cap flashing around the perimeter. One of the frustrating timing issues we had was the fact that the green roof is finished now but we will not have running water in the house until at least a week from now. 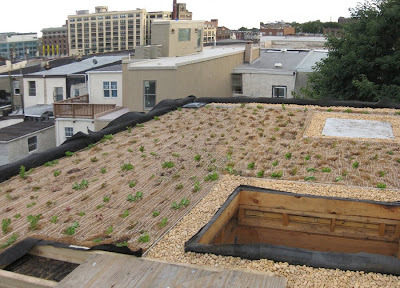 The roof needs to be watered fairly often in the first few weeks (then only periodically for the first couple of growing seasons, then it's pretty much self-sustaining). Let's just say that I have never prayed harder for rain than I did the last couple of days. And you know what? It worked. It rained steadily most of the day today (and is supposed to continue over the weekend). Our kind neighbor is allowing us to use their spicket next week until we have our own water. The plumber will install a hose bib on our roof at the exhaust chimney. We can then set up a watering system on a timer so we can keep the roof damp over the next few weeks. The deck is being constructed with Everwood, an environmentally friendly, borate-based treated wood product, that is sold at Green Depot. We considered other options (including reclaimed wood) but Everwood seemed to achieve the durability levels and the price point that we were looking for. Composite decking (such as Trex) is also a nice green product but we remain big fans real wood for decks (kind of a vice in the 'green' world, I know, but at least it's non-toxic). The GC will be finishing the deck early next week (FYI: Green Depot stocks 2x6s of Everwood but has to order 2x4s as they are not as common for decks). I'll post some pics of the finished roof deck next week. Above left, you can see Howard (orange shirt) and Pat (black shirt) from JIG laying the first layer of felt down on top the root barrier. Above right, you can see the framework for the roof deck which will lay on top of the felt adjacent the roof hatch. After the felt, they will lay down the drainage mats. Here the guys get ready to lift the large white bags of "media" (dirt) up to the roof. The bags will be suspended above roof, opened up, and the dirt evenly spread out on top of the drainage mats. You can also see the orange protective covering on the electrical lines in the image on the right. To the left is a detail shot of the scupper drainage box at the rear (low point) of the roof. There are 3 long triangular shaped "raceway" drains underneath the roof media that channel water directly to the drain in the event of heavy rain. Good thing too, since it started pouring about halfway through the media installation process. Pat said the drains worked beautifully and dirt retained just the right amount of water. You can also see the river stone drainage beds and metal edging at the rear edge and around the roof hatch and exhaust shaft. 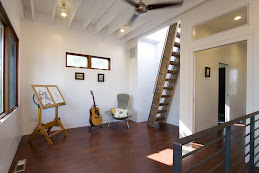 The wood to the far right is the edge of roof deck sleeper system. All the dirt is down now and deck is in place. There is some final prep work with the edging and river stone before they lay the wind protection mat. If you look closely, you can see the small white ties coming out of the dirt that will hold the mat down. The plants have not arrive on site yet but are expected later in the day. The roof is deck is not quite as big as we imagined it would be. It is 8' x 9' though, and should be enough to fit a small table and chairs or a couple of larger lounge chairs. In the end though, we think its a good size (relative to the overall area of the roof) because the bigger the deck gets, the less green roof there would be, which would end up being less cost effective and, seeing as there is no media under the deck, less effective with storm water management too. 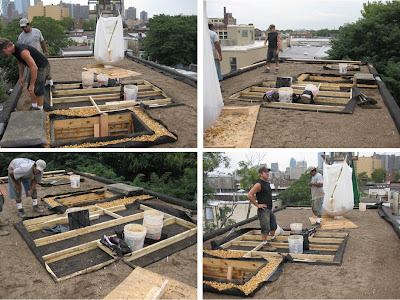 This week, JIG will begin installing the green roof and our GC will begin constructing the roof deck. We are very excited about the fact that by the end of this week we'll have a green roof and a deck! You get so caught up in worrying about all the details sometimes when building a project that you forget to stop and enjoy the project once in a while. We'll...we feel this calls for a "topping off" party, which is now in the works. Who says they're just for "tall" buildings? And seeing that in about a month, the contractor's work will be done and it will be up to us (and a few very good friends) to finish out the house (which includes: installing all the plumbing fixtures, possibly the entire kitchen, the flooring and tile work, the wood trim, any lights that aren't recessed, and a few other minor details), we feel now might be a good a time as any to enjoy ourselves a bit since things are going to get very busy, very soon. Back to the green roof... We had to scramble to get some last minute preparations taken care of before tomorrow - mainly the covering of the electrical wires out front (which can only be done by PECO) and laying down the EPDM root barrier. EPDM is a rubber-like membrane that comes in rolls and is mostly used as actual roofing membrane as it is waterproof and very durable. But it also makes a great root barrier, which is simply a barrier to keep the roots from damaging the actual roof membrane underneath. Of course, you can simply install a certain type of roof membrane that acts as both the waterproofing agent and the root barrier...but it's more expensive. Sorry if this is a bit confusing. Anyways...the root barrier issue was a bit trickier due to the fact that it is "loose laid" (which means that it is not glued down to the roof membrane, as it not necessary in this case) and is best installed just before the green roof media is to be installed so there is no chance of damage to the membrane from folks working on it in addition to the fact that unless it is seriously weighted down, it could simply blow away. It's a very heavy membrane which means it could do a lot of damage if the wind ever happened to pick it up. And of course, on our project, these two tasks (laying the root barrier and installing the green roof) are done by separate contractors and thus prove challenging when the latter is supposed to start work first thing in Monday morning and a big storm is forecasted for the weekend, thus forcing the roofer to wait till the last minute to lay the membrane . Ugh! But everything seems to be working out okay...or so they tell me. The reason we needed to cover the electrical wires is that JIG will be using a large mechanical lift (positioned in the street in front of the house) to get most of the material onto the roof. Covering the wires is simply a safety precaution in case anything or anyone should accidentally make contact with them. To the best of my knowledge, the process of our green roof installation is as follows: First, the root barrier is laid down. Then they lay down a felt over the entire roof on top of the root barrier (except where the deck is going as this area gets a 1" deep hard plastic drainage, or "dimple", board - there is no media under the deck). Second comes the drainage mat (this has felt on the upside and a open plastic wire "tangle-weave" system about 1" thick on the downside) over all all the felt. They will also install the vertical metal edging that keeps the 8" wide river stone strip (at the front and rear edge) separate from the green roof area. The stone is for wind protection for the plants and for drainage. There is also a triangle conduit (or raceway) installed from the front of the roof to the back for drainage during heavy rains. Next comes the dirt. Then, in our case, due to the fact that we have a very low parapet, they will install a biodegradable wind protection mat (made from coconut husks...kind of like a burlap) which is tied down and keeps the plants roots in place until they are established. It takes about a year for the mat to completely disintegrate. Finally, they will cut about 900 small holes in the mat and plant all the sedum plugs in the holes. Talk about tedious work. All the while, the deck is being constructed (by our GC) and will be installed simultaneously with the dirt and plants (another scheduling challenge as it involves separate contractors). Timing these together is so the dirt and plants can blend nicely into the spaces between the staggered edges of the deck boards. I am going to try to get pictures everyday this week to show all the progress. Should be a productive week! A good friend and colleague, Britton Jones (a local landscape architect) helped us out with a design for the rear patio. He gave us a few different designs (which are all great and are posted below) to review along with a great reference book called Small Garden by John Brookes. If you have a small patio and are looking to do something very cool, you should definitely check it out. It has tons of great ideas. He was also able to recommend various types of durable, drought tolerant plants that we should use. So after going over the various options with our friend and discussing the pros and cons of different elements and layouts, we decided on a plan that took what we feel are the best ideas from a couple of differen t designs. The patio portion of the site plan to the left incorporates the resultant plan (see enlarged plan to the right). 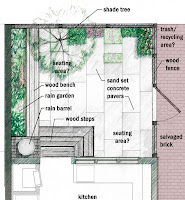 One major change from our original idea was to move the rain garden from up against the house (under the kitchen window) to along the wall that divides our patio from the neighbors. This came from our desire to keep that water away from the foundation of the house and for the garden to be tied more directly to the rain barrel. The shade tree on axis with the back door and the main interior circulation path of the house is going to be very nice. Also, we have decided to use all the salvaged brick we have to pave the alley-way from the back patio to the front sidewalk (dirt, right now) instead of using it for the patio itself. The patio will instead have large concrete pavers that will be sand set on gravel with an "open joint" laid in a running bond pattern. The concrete pattern will begin to "break up" as it approaches the rear wall, allowing for greenery to emerge and help with water absorption. Thanks again, Britton, for your wonderful design ideas and suggestions. The site plan also shows the extent of the green roof and design of the deck. The staggered edges of the wood deck reach out into the greenery and allow the boards to form a closer relationship between the two surfaces - blurring the edge between them as the plants mature. You can also see the location of the storm water planter at the edge of the front sidewalk where it meets the street. The purpose of the planter is explained in an earlier post.